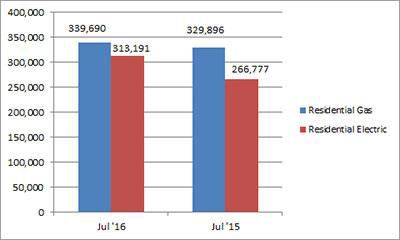 U.S. shipments of residential gas storage water heaters for July 2016 increased 3.0 percent to 339,690 units, up from 329,896 units shipped in July 2015. Residential electric storage water heater shipments increased 17.4 percent in July 2016 to 313,191 units, up from 266,777 units shipped in July 2015. For the year-to-date, U.S. shipments of residential gas storage water heaters decreased 10.5 percent to 2,492,545, compared to 2,783,727 units shipped during the same period in 2015. 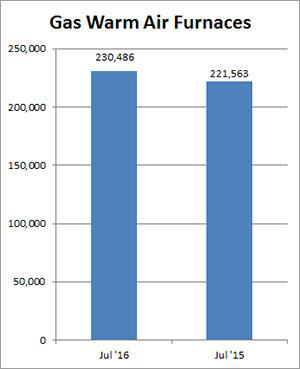 Residential electric storage water heater shipments decreased 9.9 percent year-to-date to 2,325,314 units, compared to 2,579,986 units shipped during the same period in 2015. Commercial gas storage water heater shipments increased 10.2 percent in July 2016 to 7,874 units, up from 7,143 units shipped in July 2015. Commercial electric storage water heater shipments increased 47.6 percent in July 2016 to 10,328 units, up from 6,999 units shipped in July 2015. Year-to-date U.S. shipments of commercial gas storage water heaters decreased 1.5 percent to 59,176 units, compared with 60,071 units shipped during the same period in 2015. Year-to-date commercial electric storage water heater shipments increased 47.0 percent to 73,103 units, up from 49,732 units shipped during the same period in 2015. U.S. shipments of gas warm air furnaces for July 2016 increased 4.0 percent to 230,486 units, up from 221,563 units shipped in July 2015. 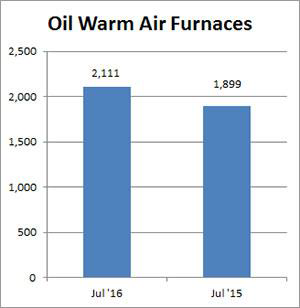 Oil warm air furnace shipments increased 11.2 percent to 2,111 units in July 2016, up from 1,899 units shipped in July 2015. Year-to-date U.S. shipments of gas warm air furnaces increased 5.3 percent to 1,519,632 units, compared with 1,442,979 units shipped during the same period in 2015. 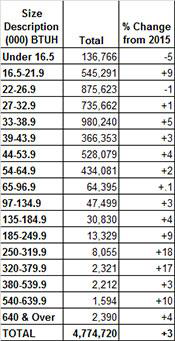 Year-to-date U.S. shipments of oil warm air furnaces decreased 4.5 percent to 15,282, compared with 16,007 units shipped during the same period in 2015. U.S. shipments of central air conditioners and air-source heat pumps totaled 785,255 units in July 2016, up 8.1 percent from 726,607 units shipped in July 2015. 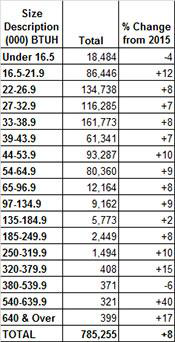 U.S. shipments of air conditioners increased 8.7 percent to 551,121 units, up from 506,914 units shipped in July 2015. 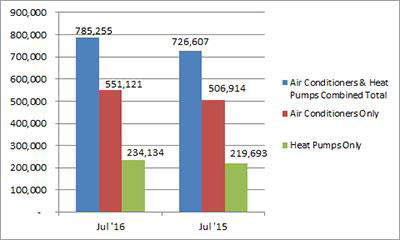 U.S. shipments of air-source heat pumps increased 6.6 percent to 234,134 units, up from 219,693 units shipped in July 2015. Year-to-date combined shipments of central air conditioners and air-source heat pumps increased 2.7 percent to 4,774,720 units, up from 4,647,370 units shipped in July 2015. Year-to-date shipments of central air conditioners increased 4.4 percent to 3,232,815 units, up from 3,095,315 units shipped during the same period in 2015. The year-to-date total for heat pump shipments decreased 0.7 percent to 1,541,905 units, down from 1,552,055 units shipped during the same period in 2015.